Successfully Added Android Car DVD Player "Road Elite II" - For Volkswagen Vehicles, 8GB Internal Memory, 3G, Wi-Fi, GPS (2 DIN) to your Shopping Cart. Android Car DVD Player designed specifically for Volkswagen Vehicles has a mega 8GB of Internal Memory in addition to 3G, Wi-Fi connectivity and GPS navigation will make your 2 DIN dash space complete. An updated version of the popular “Road Elite” car DVD player, this is the “Road Elite II”, which has all the qualities of the old one but instead of 4GB of internal memory, it now has a huge 8GB of internal memory for mass storage. Watch films, view pictures and store files on the “Road Elite II” Android DVD player plus with the extra internal memory space you can store more files to watch directly from the 2 DIN multimedia system. The “Road Elite II” is an Android car DVD system that is built to be compatible with several specific Volkswagen models, which are the Magotan, Caddy, Passat, Sagitar, Tiguan, Touran, Jetta, Skoda, Seat, CC/Polo, Golf, Golf 5, Golf 6 that are all from 2006 to 2012. 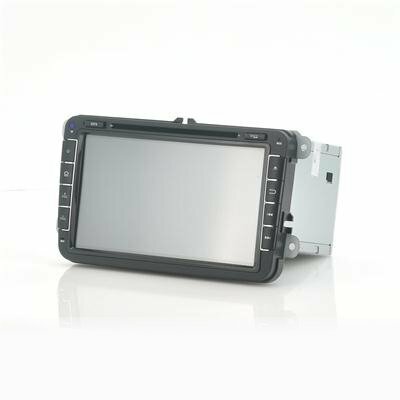 Being a standard 2DIN in size it will fit perfectly into the existing space and connect very easily with all the correct sockets and cables coming with this car DVD player. Use dongle to connect to the 3G network so you can connect and surf the web from almost anywhere on your travels. The “Road Elite II” supports a variety of 3G dongles plus if you haven’t a dongle on you then you can access the Wi-Fi by using the included Wi-Fi dongle for instant online connectivity. Never worry about getting lost or missing anything essential again when taking a road trip as the GPS navigation system will point you in the right direction while highlighting alternative routes, points of interests and other things that will make the journey more enjoyable. As the “Road Elite” has an Android operating system, it can provide the user another level of personalization that other operating systems simply cannot offer. Create new lay-out, profiles and designs as well as downloading applications from the online Google play store, the “Road Elite II” will really fulfill your driving experience. This product is in stock and can be dispatched within one working day of ordering with a 12 month warranty. Brought to you by the leaders in wholesale electronics and car DVD players, Chinavasion..
"Volkswagen", "VW" and all models of Volkswagen cars are trademarks of Volkswagen Inc., registered in the Germany and other countries. This and other similar products are not claimed to be an authorized or branded product by Volkswagen Inc. These products and our company are not affiliated with Volkswagen Inc. or endorsed by them in any way. Our products are unbranded / white box and are sourced with full respect for Intellectual Property Rights - you will never be sold a fake brand or misrepresented product by Chinavasion.com. The AM frequency is factory set to EU AM frequencies (522~1620KHz), in order to change this factory set to other frequencies beyond the factory set, you must perform the following steps: 1. Go to Windows CE settings, 2. With the remote control press 1357 this will let you enter into the factory settings and choose radio, after that just choose the region frequency according to your country. Bluetooth only works in the WIN CE system and is not supported in the Android System.